Memorial of the Mayor, Aldermen, and Inhabitants, of New Orleans. 20th Congress, 1st session, Doc. No. 26, House of Representatives. December 31, 1827. Referred to the Committee on Private Land Claims. 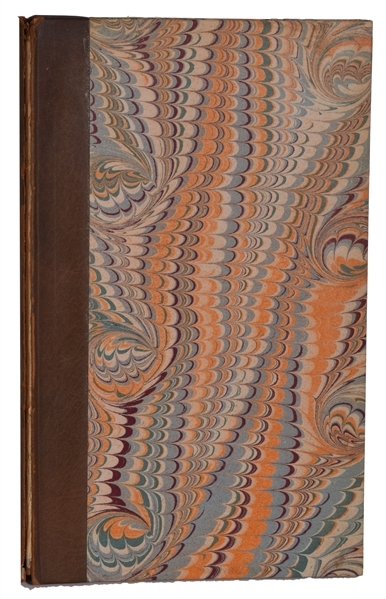 Printed by Gales & Seaton, Washington. 1828. 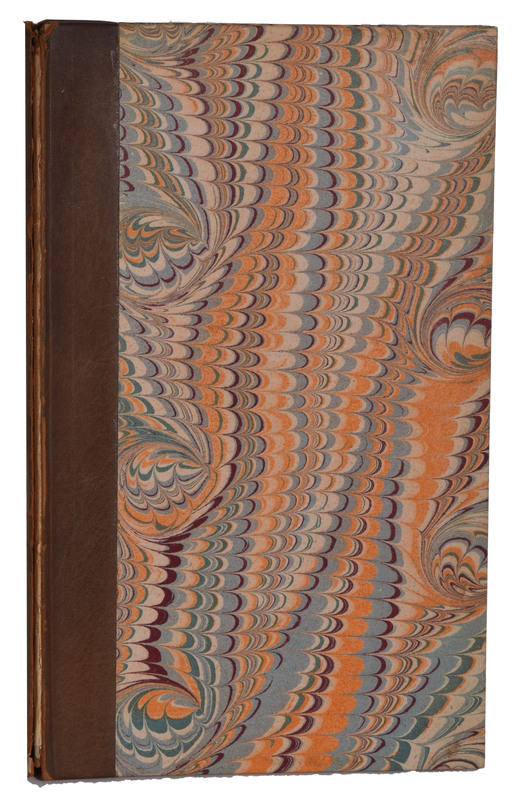 Hardcover, later binding. 6"w x 9.25h. 25 pages + fold-out map of the city. In Good condition, slight repaired tear in top of title page else fine. 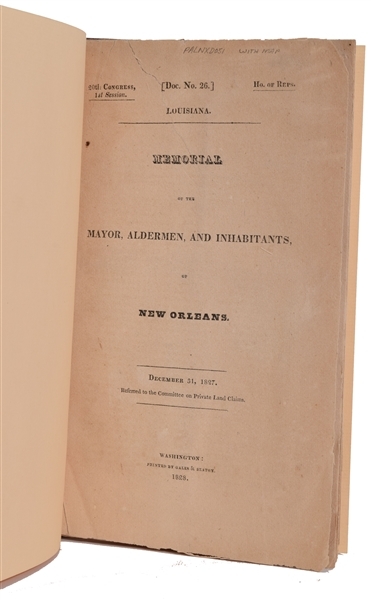 Plan de la Nouvelle-Orleans... [and] Plan of the Front Part of the City of New Orleans in 1818 [and] Plan of the Front Part of the City of New-Orleans... [in report] Memorial of the Mayor, Aldermen, and Inhabitants, of New Orleans U.S. Gov. HR Doc. 26, 20th Congress, 1st Session 1828. These three maps were drawn by Joseph Pilie, surveyor for New Orelans, and included in the 25 page Congressional report entitled Memorial of the Mayor, Aldermen, and inhabitants of New Orleans. The first plan shows the entire city laid out in a grid pattern with 18 important buildings identified by a key. The second and third show the first few streets that border the Mississippi River including the custom house, water works and Market Hall. The third map also shows the improvements made to the quays and levees. This is the rare original report with maps, not to be confused with the more common American State Papers edition from 1860. A. 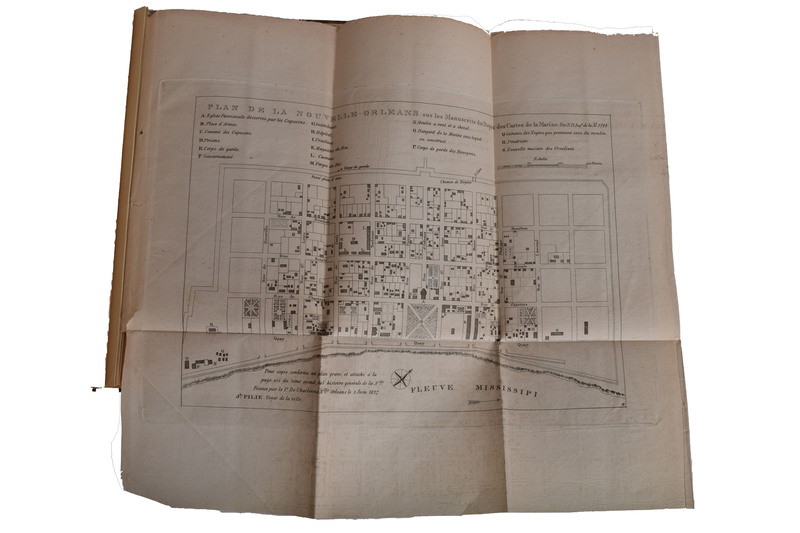 Plan de la Nouvelle-Orleans sur les Manuscrits du Depot des Cartes de la Marine (10.9 x 7.4"). B. Plan of the Front Part of the City of New Orleans in 1818 (22.1 x 7.3"). C. Plan of the Front Part of the City of New-Orleans Shewing the Additions, Alterations, and Improvements Made on the Old Quays and Levees... (22.1 x 7.3").